The Journalist Support Committee holds its first conference at the Arab Cultural Center, Kafar Souseh, Damascus, during which it launched its work in Syria, on Sunday evening, November 18, 2018. The conference was attended by a number of media colleagues, journalists and representatives of the Syrian media. 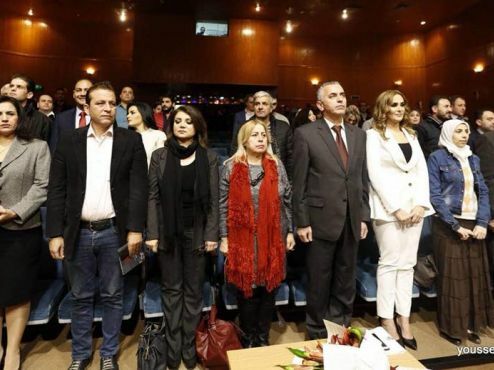 The ceremony included a speech by President of Journalists' Union Mr. Mousa Abdel Nour, and Deputy Dean of the Faculty of Information at Damascus University, Dr. Nahla Issa, and the ceremony was concluded with a speech by the Committee's representative in Syria, Ms. Maria Darwish. Ms. Maria Darwish, representative of the Journalist Support Committee in Syria, explained that one of the reasons for establishing the committee in Syria is to reduce the burden on journalists, to remove obstacles, to support and assist journalists and their families when needed, and to honor distinguished members. For his part, the President of the Journalists' Union Mr. Mousa Abdel Nour stressed during the conference that the Union is the representative body of journalists in Syria and is open to cooperating with the committee and its activities that serve journalists within an agreement or protocol of cooperation. According to Dr. Nahla Issa, the Deputy Dean of the Faculty of Information at Damascus University, the media is the most dangerous profession, noting that the media tools need further development and work. During the ceremony, two short films were screened. The first video depicts some of the dangers faced by journalists in Syria, which led to the death of some and the wounding, kidnapping and detention of others while carrying out their duty to convey the reality of the war to the general public. The second video was an introduction video about the Journalist Support Committee and its objectives in addition to the scope of its work and importance, especially in the Arab world. In conclusion, the Committee hopes that this conference will be a stepping stone towards activating its work in hopes to elevate the Syrian media and to train journalists in countering the risks while carrying out their fieldwork.